The title of shogun in Japan meant a military leader equivalent to general, and at various times in the first millennium shoguns held temporary power, but it became a symbol of military control over the county. The establishment of the shogunate (or bakufu) at the end of the twelfth century saw the beginning of samurai control of Japan for 700 years until the Meiji Restoration in the middle of the nineteenth century. During the early Heian Period the title of shogun was given for the duration of military campaigns against the north-eastern Emishi people who resisted the governance of the Kyoto-based Imperial court. The title was abandoned in the later Heian period after the northern island Ainu had been either subjugated or driven to Hokkaido. The Kamakura shogunate era lasted from the inception of the position in 1192 until 1338. After Yoritomo's death, quarrels for supremacy start between the bakufu of Kamakura and the Imperial court in Kyoto. Supplied by the Hojo clan, who also supplied the line of Hojo regents in the fourteenth century. The first Mongol invasion is defeated through bad weather conditions, with the outnumbered Japanese facing superior and much more modern forces. The second Mongol invasion is again defeated through bad weather conditions. Emperor Go-Daigo overthrows the weakened Hojo Regents, but the Ashikaga Shoguns split the country between the Northern and Southern courts. The Hojo Regents were defeated by the Imperial court, but almost immediately the Ashikaga Shoguns seized power under Ashikaga Takauji who appointed himself shogun and held the stronger north of Japan. The imperial court was reunited in 1392, and the following Muromachi Period was dominated by the Ashikaga shogunate. The Sengoku Period, the age of civil war, begins in Japan. The Tokugawa were officially established in 1603 by Tokugawa Ieyasu. Born in 1543 to a family of provincial lords, he established an elite army at a young age and began rolling back the boundaries of his feudal lands. He was the main beneficiary of the achievements of two powerful daimyo (feudal lords), Oda Nobunaga and Toyotomi Hideyoshi. Initially an opponent of Nobunaga, with whom he had shared childhood as a hostage of the Oda clan, the two eventually reconciled and became firm allies, dominating Japan. Nobunaga's death allowed Ieyasu's main rival, Toyotomi Hideyoshi to secure his place as the most powerful daimyo, but Ieyasu's startling and well-managed victory over his son's forces at Sekigahara was total. He now dominated the imperial court which entered the Edo Period, with a capital in the city of the same name (modern Tokyo). Under his governance Japan experienced relative peace for the next two and-a-half centuries. US Commodore Matthew Perry arrives with a fleet of ships on 8 July and forces Japan to end its period of isolation. This contributes to the weakening of the shogunate, and internal factions eventually bring about its termination. 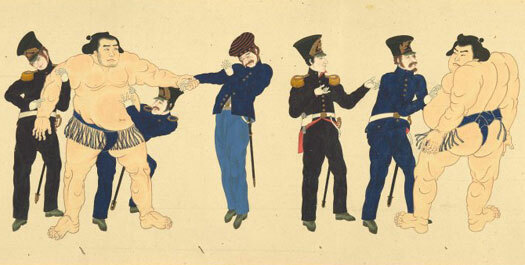 Following the treaty entered into between Commodore Perry and the Shogun in 1853, the first US consul general, Townsend Harris, arrives on Japanese soil to take up his office. Initially, the Japanese refuse to recognise his official status, treating him as a private citizen and a barely-honoured guest. After eighteen months of protracted negotiations and a personal audience with the Shogun, he is able to open the first US Consulate in Shimoda under the terms of the 'Harris Treaty' (as described by the John Wayne feature film, The Barbarian and the Geisha, 1958). The shogun resigns. While being part of a movement which had aimed to reform the aging shogunate, Yoshinobu is ultimately unsuccessful. The Modern Period begins in Japan.